On Wings of Eagles: EGGsellent devotion on character. 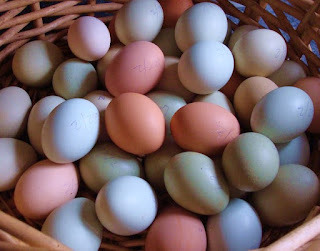 We have had chickens which laid brown eggs, green eggs, blue eggs and white eggs. Each day we would check their nests and while we were doing so there were always a few that would sing out. On some days we would have lots of eggs and on others all the ladies seemed to go on strike. Some of the eggs were small. There were times when I felt like getting a large egg and showing it to the chicken that lays the small egg and saying, “Now take a good look at this and try harder.” But even if I had, it wouldn’t have made much difference. Each type of bird laid a characteristic egg and no amount of encouragement would make them lay a different egg. Of course there are always a few rotten eggs. Those who have unrealistic eggspectations, eggsclude others, and eggsploit people. There are those who are always making eggcuses and always focusing on eggsternal things. Jesus said you can tell a tree by its fruit. But you can also tell a bird by its eggs. Dear Lord, help us to not be a rotten egg but to be the Eggsellent person You had planned for us to be. In the Name of Jesus, Amen.